On the first drive we had the tricky bit to do, shoot any bird's going towards the big house as we cannot retrieve any from the gardens. 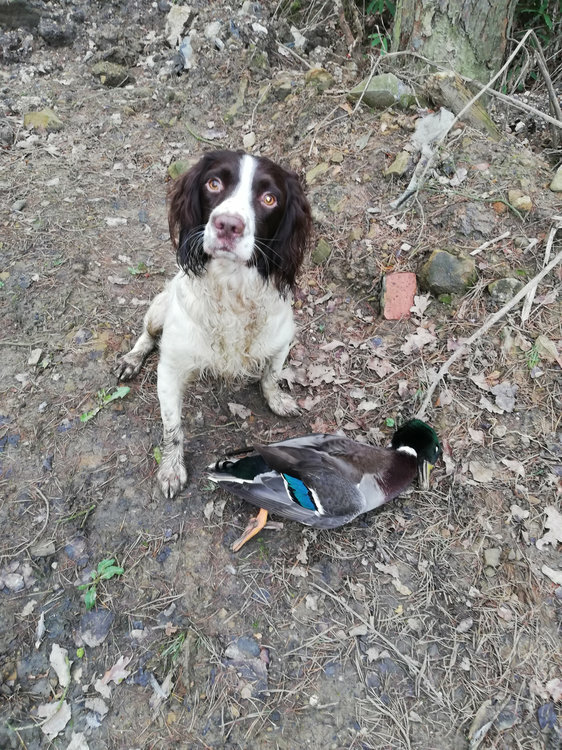 First two hit but went over the house not a good start the next one was perfect 40 yards out in the open ideal for Stan to retrieve, next thing a cocker streaks through the cover crop and grabs it, Stan had been sitting without moving and just looked at me in disbelief. The next bird came down but was a runner Stan was sent even though this was his first runner. As it was a fair distance away when it hit the ground it then ran into the gardens, Stan stopped on the whistle as asked and then recalled and came back immediately. All during the day my little dog behaved perfectly never moving at all from where he was asked to sit. The gun next to me shot a hen bird that fell at the top of a steep bank. When the drive finished Stan was sent for it I left it for him to work out for himself but he very quickly found it 30 yards further away than I thought it was delivered to hand I was well chuffed. He did eventually pick a pricked bird with a little faffing about but soon mastered it. The only movement all day was his head either looking at me or towards the beaters that at time's sounded like a cross between a rave and an argument with the whistling and shouting. He took today in his stride no fuss no drama and did everything I asked of him. I am very proud of this little chap, is he perfect no I still have a few bits to do with him but I cannot believe how good he has turned out. It's no fun is it ???? noooo just kidding. Having had 14 dogs through my shooting life there is nothing quite like that first big day out with witnesses. Well done Little Stan, get him to take you for some pigeon flighting; now that is fun. Good effort both of you. Sounds like a great day for both of you and he would be welcomed on any shoot with that behaviour !! Get him in a trial mate he’s a cracker! Congrats, sounds like u've had a cracking day and a cracking season. Maes all the hard work u've put into the dog really worth it. Keep at it and it will be better for next season. What time will you have finished your Nut roast? Bloody Vegans , I think they all need a good dose of lead. I used to work with a vegan athlete , who openly admitted he had to supplement his food with various tablets. But back to the subject , congratulations on having such a dog that has engraved his memory on you for life . We never forget any of our dogs , good or bad , all have fond memories. But the superb ones live on for ever .